It is fundamental to the understanding of science that science is understood to be a process of trial and improvement and represents the best known at the time, not an unerring oracle of truth. Development of an idea and refinement through testing is shown more in the understanding of atomic structure. A bust of Democritus (or Democrites), who came up with the idea of indivisible atoms. The earliest known proponent of anything resembling modern atomic theory was the ancient Greek thinker Democritus. He proposed the existence of indivisible atoms as a response to the arguments of Parmenides and the paradoxes of Zeno. Parmenides argued against the possibility of movement, change, and plurality on the premise that something cannot come from nothing. Zeno attempted to prove Parmenides' point by a series of paradoxes based on difficulties with infinite divisibility. In response to these ideas, Democritus posited the existence of indestructible atoms that exist in a void. Their indestructibility provided a retort to Zeno, and the void allowed him to account for plurality, change, and movement. It remained for him to account for the properties of atoms, and how they related to our experiences of objects in the world. 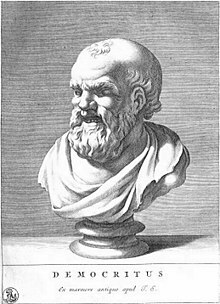 Democritus proposed that atoms possessed few actual properties, with size, shape, and mass being the most important. All other properties, he argued, could be explained in terms of the three primary properties. A smooth substance, for instance, might be composed of primarily smooth atoms, while a rough substance is composed of sharp ones. Solid substances might be composed of atoms with numerous hooks, by which they connect to each other, while the atoms of liquid substances possess far fewer points of connection. All matter is composed of atoms, which are bits of matter too small to be seen. These atoms CANNOT be further split into smaller portions. There is a void, which is empty space between atoms. Atoms are homogeneous, with no internal structure. Atoms are different in their size, their shape, and their weight. Although alchemy was futile, the alchemists did come up with several useful methods, including distillation (shown here). A fire, shown by Lavoisier to be a chemical reaction and not an element. Empedocles proposed that there were four elements, air, earth, water, and fire and that everything else was a mixture of these. This belief was very popular in the medieval ages and introduced the science of alchemy. Alchemy was based on the belief that since everything was made of only four elements, you could transmute a mixture into another mixture of the same type. For example, it was believed that lead could be made into gold. Alchemy's problem was exposed by Antoine Lavoisier when he heated metallic tin in a sealed flask. A grayish ash appeared on the surface of the melting tin, which Lavoisier heated until no more ash formed. After the flask cooled, he inverted it and opened it underwater. He discovered the water rose one-fifth of the way into the glass, leading Lavoisier to conclude that air itself is a mixture, with one-fifth of it having combined with the tin, yet the other four-fifths did not, showing that air was not an element. Lavoisier repeated the experiment again, substituting mercury for tin, and found that the same happened. Yet after heating gently, he found that the ash released the air, showing that the experiment could be reversed. He concluded that the ash was a compound of the metal and oxygen, which he proved by weighing the metal and the ash, and showing that their combined weight was greater than that of the original metal. Lavoisier then stated that combustion was not an element, but instead was a chemical reaction of a fuel and oxygen. Elements are composed of tiny particles called atoms. Atoms of one element can combine with atoms of other elements to form chemical compounds; a given compound always has the same relative numbers of types of atoms. We now know that elements have different isotopes, which have slightly different weights. Also, nuclear reactions can divide atoms into smaller parts (but nuclear reactions aren't really considered chemical reactions). Otherwise, his theory still stands today. In the late 1800's, Russian scientist Dmitri Mendeleev was credited with creating one of the first organized periodic tables. Organizing each element by atomic weight, he cataloged each of the 56 elements discovered at the time. Aside from atomic weight, he also organized his table to group the elements according to known properties. While writing a series of textbooks, Mendeleev realized he was running out of space to treat each element individually. He began to regularly "linewrap" the elements onto the next line, and create what is now called the periodic table of the elements. Using his table, he predicted the existence of later-discovered elements, such as "eka-aluminum" and "eka-silicon" (gallium and germanium) according to patterns found earlier. His predictions were a success, proving his table to be exceptionally accurate. Later theories, those of the electrons around the atom, explain why elements in the same period, or group, have similar chemical properties. Chemists would later organise each element by atomic number, not atomic weight, giving rise to the modern Periodic Table of Elements. Cathode rays are actually made of electrons. Soon after the discovery of the electron, Thomson began speculating on the nature of the atom. He suggested a "plum pudding" model. In this model the bits of "plum" were the electrons which were floating around in a "pudding" of positive charge to match that of the electrons and make an electrically neutral atom. A modern illustration of this idea would be a chocolate chip cookie, with the chips representing negatively charged electrons and the dough representing positive charge. The results of the gold foil experiment disproved the "plum pudding" model: the alpha particles should have passed through (top), but a few of them deflected at large angles (bottom). Ernest Rutherford is known for his famous gold foil experiment in 1911. Alpha particles, which are heavy and positively charged (actually, helium nuclei, but that's beside the point), were fired at a very thin layer of gold. Most of the alpha particles passed straight through, as expected. According to the plum pudding model all of the particles should have slowed as they passed through the "pudding", but none should have been deflected. Surprisingly, a few alpha particles were deflected back the way they came. He stated that it was "as if you fired a 15-inch shell at a piece of tissue paper and it came back and hit you." The result of the experiment allowed Rutherford to conclude that the plum pudding model is wrong. Atoms have a nucleus, very small and dense, containing the positive charge and most of the atom's mass. The atom consists of mostly empty space. The electrons are attracted to the nucleus, but remain far outside it. Bohr created his own model of the atom, improving on Rutherford's. Bohr used an equation developed by Rydberg that provided a mathematical relationship between the visible spectral lines of the hydrogen atom. The equation requires that the wavelengths emitted from the hydrogen atom be related to the difference of two integers. Bohr theorized that these integers represent "shells" or "orbits" in which electrons travel around the nucleus, each with a certain energy level. The energy of an orbit is proportional to its distance from the nucleus. An atom will absorb and release photons that have a specific amount of energy. The energy is the result of an electron jumping to a different shell. Starting with Rydberg's equation, along with Planck and Einstein's work on the relationship between light and energy, Bohr was able to derive an equation to calculate the energy of each orbit in the hydrogen atom. The Bohr model depicts the atom as a nucleus with electrons orbiting around it at specific distances. This model is also referred to as the Planetary Model. Robert Millikan is accredited for the "Oil Drop Experiment", in which the value of the electron charge was determined. He created a mechanism where he could spray oil drops that would settle into a beam of X rays. The beam of X rays caused the oil drops to become charged with electrons. The oil droplets were in between a positively charged plate and a negatively charged plate which, when proper electric voltage was applied, caused the oil droplet to remain still. Robert Millikan measured the diameter of each individual oil drop using a microscope. coulomb, was the charge of the electron.